Ten strangers. Six days in paradise. One unforgettable Christmas. Hailey Walsh has always loved Christmas, and this year the holiday was supposed to be the most magical of all, spent with her large family and her fiancé in preparation for their wedding just two days after. Then Gage broke their engagement. Now, instead of playing in the snow with her nieces and nephews, Hailey’s building a playground with children she’s never met before, spending her Christmas with strangers in Hawaii, on a service program she hopes will lift her spirits and help her begin to pick up the broken pieces of her life and heart. Gage Stevens didn’t want to spend Christmas in Hawaii any more than he wanted to break his engagement, but sometimes fate has a way of slamming a guy against a wall and forcing him to tough decisions— for the good of others, be that his ex-fiancée or his mom. And while he’s certain that no ocean breeze or tropical wonderland can heal what’s wrong, one glimpse at a familiar head of red hair and Gage realizes fate may not be done with him yet. I loved the themes in this story! Gratitude, service, friendship, and hope helped Hailey as she struggled through the aftermath of an unexpected breakup. Realizing that others are also enduring trials, ones she considered tougher than what she was experiencing, was the first step in finding things to be thankful for. The wisdom of Micah and Lucy who run the program brought depth and perspective, and my favorite quote was "Alternate endings can be happy too." The Hawaiian setting was fun and provided an escape for the people who are looking to reset, reevaluate, and prepare for a new future. I didn't understand or agree with Gage's choice to not communicate what he's going through with Hailey, although this is what provided the plot. I liked the parts where Hailey is finding healing and peace, and knows that she will be okay whether she gets back together with Gage or not. The perfect relationship sometimes means letting things get a little messy. Lucy Morley’s older sister is perfect, and her younger brother is nearly there, too. Yet Lucy can’t even hold down a job, let alone stick with something like college. She drops out and floats from job to job. After yet another disastrous firing, she lands an interview at a bookstore—her dream job—and it doesn’t hurt that her new boss, Adam Parks, is pretty much her dream man. But if Lucy is good at one thing, it’s guarding her personal life and more importantly her heart. Adam has other plans in mind, though, and they include finding a way into Lucy’s heart. This author is one of my favorites for clean contemporary romance. I can always count on her to strike a balance with humor, emotion, and romantic chemistry- without getting too dark or too fluffy. I liked Lucy and her enthusiasm, even though she feels inferior to her siblings. She has a healthy self-acceptance and seems to be searching for her role and purpose. She finally finds a good fit working at cozy bookshop, and I enjoyed the sense of family there (even when it was at times dysfunctional, courtesy of Adam's sister). Adam is a decent guy, and I appreciated that his attraction to Lucy never crossed the creepy boss line, but remained appropriate while friendly. A super cute story that ended too quickly for me! Livvy knows Dr. Slade McKinney is the perfect man for her, but when she keeps running into Mason, Livvy discovers fate has a different plan. 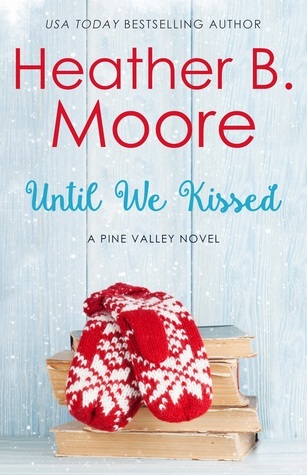 Pine Valley librarian Livvy Harmon has big dreams, which include marrying Dr. Slade McKinney. Trouble is, he’s only kissed her once in their four months of dating, and it wasn’t all that great. But Livvy isn’t ready to give up yet on hooking such an amazing man, even though Slade seems to have time for everyone but her. 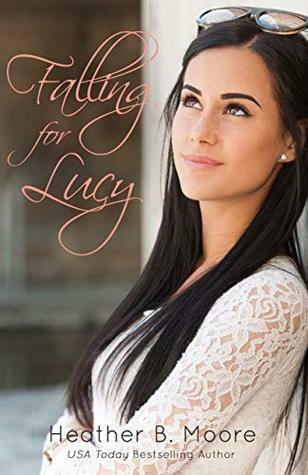 When Livvy keeps running into writer Mason Rowe, who seems to be camping out in her library to finish his book under strict orders from his agent, Livvy at first keeps him at arm’s length. But the more their friendship grows, the more she finds that her dream relationship with her doctor boyfriend isn’t so dreamy after all. Another fabulous book in the Pine Valley series! Each time a book comes out it's my new favorite ;) This one has a librarian and author... with the best first kiss scene I've read in a while! I loved the character-driven plot, the dynamics of the relationship between Livvy and Mason, the humor and emotion. I do have one argument- I don't think Dr. Slade was ever Livvy's "boyfriend". They were casually dating. He was in no way behaving the way a real boyfriend does. (They would go two weeks without talking or seeing each other!) So I don't think she was cheating on him when she began a relationship with Mason. Which is why I didn't have those icky "eww, she's cheating" feelings. ANYWAY.... Mason is such a contrast to the preoccupied doctor that Livvy can't help but fall in love with him, even though he doesn't fit the future she has planned out for herself. This is a fun story with emotion, humor, and great romantic chemistry! Miss Belle Heartstone—heiress and savvy businesswoman—needs a husband. Immediately. As in, yesterday would not have been soon enough. Her mother’s attempts at matchmaking have been disastrous. So Belle decides to solve the problem her way—survey the market and purchase the best groom available. Colin Radcliffe, Marquess of Blake—debt-ridden and penniless—needs a large infusion of cash. Desperately. Preferably cash that does not come with a wife attached. It is no surprise, then, when he receives Miss Heartstone’s brazen proposal—her cash, his title, their marriage—that he politely declines. But before he leaves her, Blake suggests something truly radical: Maybe before finding a husband, Belle should find herself. His simple words send them both on an unexpected journey, spanning continents and years, entwining their lives in ways neither could have foreseen. Can two lonely souls move past societal expectations and forge a unique life together? 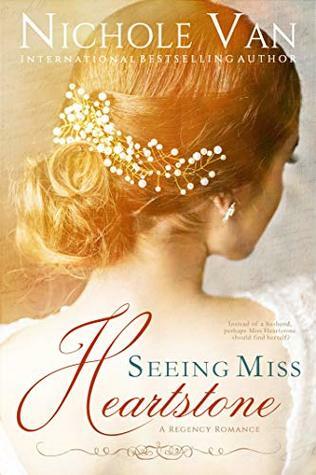 Please note: The basic storyline of Seeing Miss Heartstone was originally published as a novella titled, An Invisible Heiress, in the Spring in Hyde Park anthology. This current novel is a greatly expanded version of that plot, adding over 200 pages of text and creating a more robust, well-developed story. I enjoyed the characters in this Regency story because of how they sought to expand their horizons and were courageous enough to make changes to achieve their goals. Belle and Colin challenge each other in the best ways, complementing each others strengths and forming a strong business and friendship. I liked that they helped those less fortunate, especially veterans of the Napoleonic wars and their families. I felt bad for Colin that he was kept in the dark for so long, but understood why. There is plenty of angst as Belle and Colin both struggle with how to reveal/expose the secret identity of LHF. The storytelling is enhanced with letters between the two over the years, and I can't imagine waiting six months for replies! I liked the story when it was a novella, and even better as a novel with more themes explored and a deepening of the thoughts and emotions of Belle and Colin. A sweet romance with ups and downs between two people who are perfect for each other- if only they can manage to forgive and trust. I have a famous secret, but it's not the biggest one I keep. From an outside view, my life would be the definition of boring. I'm married to a landscaper, albeit a very attractive one, I drive an old cheap car, and I write articles for an online magazine. So, maybe I've been a constant fixture on the New York Times Best Sellers list for the last few years, but that secret is locked safely in my attic. Here's a word of advice. If you want to keep a secret, don't tease your mother-in-law about what's in that attic, especially when her life goal is to save her son from you. Now that my famous secret is out, past acquaintances willing to do anything to get their own fifteen minutes of fame are lying to the media about me. But my biggest problem isn't the lies in the press, it's the truth I'm forced to face. The secret I've kept from everyone, even my husband, the man I love, the first person who made me feel like I belonged somewhere. Now I have no other choice but to tell the truth and face my biggest fear, that Peter and I were never meant to be together and my secrets could take him away too. Make me ugly cry, why don't you Jennifer Peel! The character of Delanie is someone I cannot relate to at all, but that doesn't matter, because the author does such a skillful job of getting me in her head and feeling her emotions and understanding why she is the way she is. The story begins four years into her marriage, and she's living in a kind of oasis with her perfect husband. Her life before Peter was complicated and intense, and her life after her secrets begin to unravel is also complicated and intense, but now her relationship has to weather the storm. I appreciated the way the author built the backstory and let us get to know and like Delanie, Peter, and his family (at least certain members) before unleashing the real angst. The mother-in-law drama in the first part of the book is just a warm up. I'm doing my best to not reveal any spoilers while still persuading you to read this compelling book! Just know that by the end I was streaming healing tears as the story made me think about circumstances in my own life... but I did far more laughing than crying while reading the book overall. I loved the way Delanie and the other characters are real and flawed, accepting of themselves but also trying to improve. Delanie's individual sense of humor came across in her voice and I enjoyed more of Sam from the previous book in the series, The Sidelined Wife, who is also pretty funny. The books don't have to be read in order but I was glad I did and I highly recommend reading both! Abigail Nash leads a lonely existence. Her mother died giving birth to her, her father’s business dealings took him away more often than not, and her ailing great-aunt, unable to provide much in the way of companionship, was a lack-luster guardian at best. So when her dear friends offered to launch her into London society, it appeared Abby’s life was taking a turn for the better, with suitors and social engagements aplenty. When she marries a proclaimed darling of the ton, it seems she will at last settle into the life of her dreams. But appearances aren’t always what they seem, and dreams often become disappointments. Just months into her marriage, Abby finds herself widowed, penniless, increasing, and determined to never hope again. 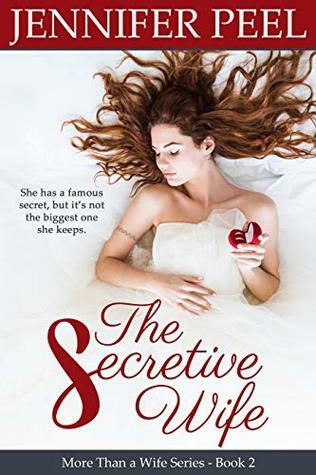 But when her late husband’s brother, the Earl of Brigston, attempts to thaw the numbness surrounding her heart, Abby must decide if she has it in her to risk another chance at happiness, knowing the odds are not in her favor. I loved this sweet Regency romance and the way the two main characters began as brother and sister-in-law, developed a friendship, and began to rely on each other during a difficult and grief-filled time in their lives. The dynamics of the family were interesting and the story kept moving forward as things shifted and changed between Abby and Morgan. I loved how gentle their romance was! There is a bit of a mystery why Jasper (the younger brother) and Abby eloped in the first place, and the layers are revealed slowly, increasing the anticipation and revealing new difficulties for the future. This author is a skilled storyteller and I was glued to the pages until the very end. Highly recommend! Abby dropped it as though it had burned her, and Morgan tried not to cringe at the thought of filthy water coating his face. 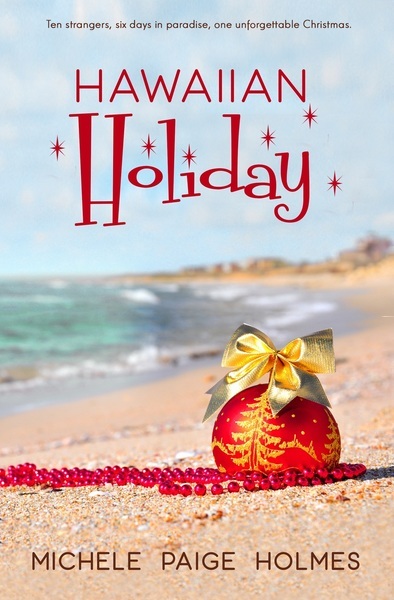 Giveaway Details $25 Amazon Gift Code or $25 in PayPal Cash Ends 1/10/19 Open only to those who can legally enter, receive and use an Amazon.com Gift Code or Paypal Cash. Winning Entry will be verified prior to prize being awarded. No purchase necessary. You must be 18 or older to enter or have your parent enter for you. The winner will be chosen by Rafflecopter and announced here as well as emailed and will have 48 hours to respond or a new winner may be chosen. This giveaway is in no way associated with Facebook, Twitter, Amazon, BookBub, Instagram, Rafflecopter or any other entity unless otherwise specified. The number of eligible entries received determines the odds of winning. This giveaway was organized by Kathy from I Am A Reader & Clean Wholesome Romance and is sponsored by the author. VOID WHERE PROHIBITED BY LAW. Ainsley is drowning in the depth of her despair. One wrong decision left her alone, with only regret as her constant companion. To escape it all, she makes another choice. One she hopes will end everything. Instead, she’s thrown into a whole new world filled with opportunities she doesn’t believe she deserves. Ethan gives the appearance of breezing through life. But underneath his bright facade, he’s scarred by loss. When fate leads him into Ainsley’s world at the exact moment she needs someone the most, he can’t ignore the chance to right the wrongs of his past. Ainsley and Ethan will struggle to help each other heal and start anew. They’ll learn that the secret to conquering their pain lies within their power, if only they can do it together. Always together. “FILL THESE OUT, PLEASE.” The nurse at the ER admin desk shoved a clipboard holding a stack of insurance forms into my hands. “Once we get your partner stabilized, I’ll go find out about sending you in to see her.” She gave me a curt nod and disappeared behind the desk. What had I been thinking? I hadn’t been thinking. Not much beyond getting my neighbor here in time. I had been living next door to Ainsley for the last six months, ever since the construction on my house was completed. And I had noticed her from day one. Who wouldn’t, with her striking blue eyes, long blonde hair, and a body every man dreams of? But there was more. She had this frailty about her, if you looked close enough. And it drew me in, right from the start. But she never let me get further than a few pleasantries. Still, it didn’t stop me from trying. And I had tried to be her friend. When I found her earlier today… I shuddered as the memory washed over me. I clutched the letter in my hand, secretly happy I had an excuse to ring Ainsley’s doorbell. The mailman had messed up and I couldn’t let the opportunity slide, noting her car in the driveway. Walking up to the door, I rolled my shoulders and took a deep breath, aiming for cool and suave, not flustered and eager like she had me feeling each time I caught a glimpse of her. I rang the bell and turned to soak up the bright rays of sun, feeling my stomach knot as the anticipation rose. A few seconds passed, but no one came to open the door. I turned to ring the bell again, sure she was home, when I stopped dead in my tracks, my hand still suspended in the air. My heart started pounding in my chest as the ground beneath me felt like it was moving. “Ainsley! Ainsley!” I pounded on the door, her lifeless body sprawled on the floor in the hallway just visible through the sidelights. My palms felt moist as I fought against the rising panic. “Ainsley! !” My voice was hoarse as I belted out her name over and over. Instinct took over. I ran to the back door and found it unlocked. I hadn’t ever let myself in, but now wasn’t the time to worry about that. “Ainsley!” I fell on my knees next to her, taking in the full scene. Her chest was barely moving, her lips a faint shade of blue. An empty pill bottle lay on the floor beside her. I picked it up, already sure of what was going on but needing to confirm it. Time seemed to stand still as I pieced it all together, but the loud, ringing sound in my ears forced me to move and get help. “Ainsley, what have you done?” I cried as I slipped my phone out of my back pocket and called 911. I hoped I wasn’t too late, that we still had time. “What happened?” One of the paramedics loaded her on a gurney while the other got to work checking her vitals. I rehashed all I knew, which wasn’t very much. They loaded her in the ambulance, and after getting the right info about where they were taking her, I sped over to the hospital in record time. “What’s your relationship to the patient?” The ER clerk typed in Ainsley’s name without making eye contact. “Only the next of kin can see the patient.” She looked up for the first time and took in my panicked state. “I’m her…boyfriend.” Where did that come from? I didn’t even know her that well, but I couldn’t take it back now. “I see.” The woman stared up at me over her wide-rimmed glasses, pausing as she studied me. Did she pick up on my hesitation? Did she detect the lie? “Please take a seat. I’ll have her paperwork ready in just a sec.” I released the breath I held and dropped down in the vinyl seat, overcome by the events of the past hour. I’d been waiting for over two hours, and I was frantic. I didn’t do so well in a hospital setting. “Mr. Van Der Beek?” A doctor dressed in light blue scrubs walked into the waiting area. I stood up. “Yes?” My heart beat double time, waiting for him to give me news on Ainsley. “We’ll know for sure tomorrow. I think you got to her in time.” He patted me on the shoulder and turned to leave but reconsidered. “Mr. Van Der Beek.” He stared into my eyes. “Your girlfriend is very sick. Even if she makes a full physical recovery, you have a long road ahead of you.” I nodded, my eyes stinging. “Thank you, Doctor.” I sank onto one of the chairs lining the side of the waiting area. If anyone knew how long that road was, it was me. Mylissa Demeyere was born in Belgium, and resides in the beautiful city of Ghent. She lives in a somewhat organized home with her four beautiful children and the love of her life. If she isn’t working, she’s writing, running, reading, or enjoying time with her kids, who are growing up way too fast. The Songs That Brought Me Back is her second novel in The Songs Series, with a third book releasing in the middle of 2019.